The heatwave may have ended here but it is still pretty warm, too warm for me! I know, I'm just making excuses not to do my housework, but that mean more time for crafting. My friend Lisette (aka Mrs Beez) and I have recently been posting projects featuring butterflies. It all started when Lisette decided to raise awareness of the charity Amy and Friends, and the work they do to help children suffering from Cockayne Syndrome. Why butterflies? Well, Amy and Friends adopted the butterfly to represent those whose lives have been cut short by this terrible illness. I have a pretty birthday card to share with you today. This lovely digital stamp is from Sweet 'n Sassy Stamps. After colouring it with Promarkers, I mounted it on purple pearl card. 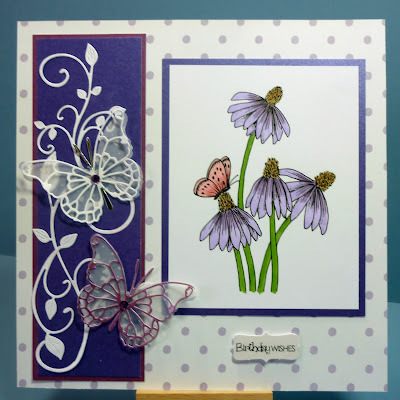 The flourish die cut is from Cheery Lynn and the butterfly dies are Memory Box. Finally, I added a small sentiment from Craftwork Cards. Very pretty. Love the combination of the stamped image and then the die cuts. Loving that spotty paper too! Super gorgeous card, Dionne! The design is just amazing! Love the choice of your image and all your work on the left side of the card... absolutely gorgeous! You right - it is a pretty birthday card - it is gorgeous!